Can Mobile Phones Help Dexterity and IQ? Home > Mobile Phone Uses > Can Mobile Phones Help Dexterity and IQ? Mobile phones have a powerful influence over our lives, but are they good for us, and more specifically for our IQ and dexterity? Do Mobile Phones Improve or Erode Literacy Skills? Whether mobile phones have a positive or negative effect on IQ levels and literacy has been the subject of ongoing study and debate. The original concern was that children who exchanged text messages with their friends in the abbreviated language form known as text speak – or txt spk – were doing so at the expense of their literary skills. When a 13-year old Scottish pupil wrote a description of her recent holidays entirely in text speak, it was cited by some teachers as being a clear example of how spelling and grammar abilities were under threat from the mobile. A study at Coventry University countered the popular fears by showing that the use of text message abbreviations actually had positive links with literacy amongst youngsters. Furthermore, the research found the children with better spelling and writing skills were actually those that used the most ‘textisms’. Other research found there were no significant differences between the literary skills of texters and non-texters. However, it did suggest that although texting might not affect grammar or spelling it may still have a detrimental effect in stifling the quality and expressiveness of a child’s writing. The study found that keen texters wrote considerably less when asked to describe a picture or occurrence than those who didn’t use mobile phones. Texting may not improve literacy but that is not to say that the mobile phone is redundant as a teaching aid. A new service hopes to use new mobile technology to encourage more people – adults as well as children - to read books, and help combat the UK’s worrying literacy statistics, which show 5 million adults cannot read. ICUE – pronounced ‘IQ’ – has made thousands of books, both modern and classic, available to download onto your phone. To try and make the idea more exciting to those turned off by reading whatever the medium, the system uses an engaging new technique that flashes words one at a time, at speed, onto the mobile screen. Do You Suffer From Infomania? Harnessing modern technologies may be a logical way to help improve IQ and literacy but what if computer technology itself is damaging to our intelligence? Scientists at the University of London recently claimed that texting and emailing could be twice as bad for brainpower as puffing on cannabis. The study found that there was a significant drop in IQ amongst employees that are constantly distracted by checking their messages. The psychologists dubbed this state of mental distress provoked by new technology as ‘infomania’. People who continually interrupt their daily work routine by answering emails and text messages could be sacrificing up to 10 points off their IQ score. As mobile phones get more advanced they seem to be getting smaller and ever more fiddly. While this might be good news for the young and nimble fingered wanting to improve their dexterity, for the millions of others not blessed with matchsticks for fingers, limited dexterity is likely to become an increasing problem. If you are concerned about being able to operate a new phone adeptly then the best advice is to try before you buy. Although there are certain models available that have a more simple design and better defined and easy-to-feel buttons, they may still not appropriate for you once you have handled one and tried it out. Voice-activated dialling allows users to dial numbers using voice recognition rather than the keypad. 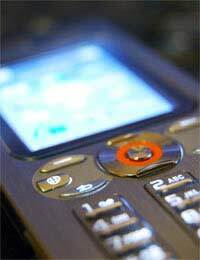 Speed dialling or one-touch dialling enables users to dial a number at the touch of a button. Pre-set text messages allow the user a number of standard text messages that they can reuse. Predictive text messaging is also useful for reducing the number of keystrokes required to send a text. This feature predicts the words you are about to type based on previous messages or common words. There are also mobile phones designed specifically for total ease of use. The Emporia Life phone has been designed with mobile users with sight deficiencies in mind. It has large text and a high contrast screen that can even be read in bright sunlight conditions.